As every Golfer knows, there is nothing more frustrating than playing a round that is longer than expected or on a course that is backlogged with players. We understand that time is valuable and a slow pace of play can affect your focus, schedule, patience & overall golfing experience. Each Golf Course faces its own unique challenges when it comes to pace of play, here at South Shore we are taking an active role in an effort to enhance the guest experience. In order to achieve a faster pace, we have provided a few tips that every golfer can practice during their round to help us improve the pace of play on the course. Play from the correct tee box: Players with a handicap greater than 10 should not play the back tees (or championship tees). Play "Ready Golf": If you are not ready to hit when it is your turn, encourage one of your fellow players to hit ahead of you. Proper Golf Cart Access: Park you golf cart on the path close to the green for quick access after putting. Club Placement: Lay your wedges on the flagstick on the fringe of the green between the hole and your cart. This will help limit time spent searching for lost or forgotten clubs on previous holes. Limit your time searching for lost golf balls: The PGA recommends spending no more than 3-5 minutes searching for lost golf balls. Cutting down on search time can add up over the course of 18 holes. Plan Ahead for Success: When your group members are playing their shots, use this time to prepare for yours by reading the green for your putt or checking your yardage to select your club for your next shot. 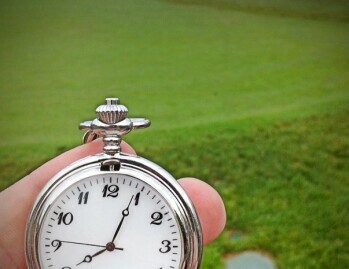 PGA Golf etiquette recommends taking no more than 30-45 seconds from the time you select your club to the time you hit your shot. Help out your fellow players: By raking sand traps for fellow players, you can allow your fellow golfers to move on quickly to the next putt.